The school directory below includes 221 local universities, colleges and schools in the United States that are offering CAAHEP accredited Diagnostic Medical Sonography (also called ultrasound technology) programs in 2019. There are two schools offering accredited online ultrasound programs for students who prefer distance education. The programs include general sonography programs, cardiac sonography programs, vascular sonography programs and pediatric cardiac sonography programs. The school directory is updated in 2018. Students should start their search for ultrasound programs by looking in particular locations or at particular schools. They can also look for programs based on the type of degree that they want to earn. The school directory provides a link to each school website plus some basic information like in-state tuition rate, size of the student population, acceptance rate, and more. While this website strives to maintain accurate and updated information, the educational facilities may make changes in between our updates so students should always verify the degrees offered by visiting the websites of schools of interest or calling the school using the provided contact information. Find top sonography or ultrasound technician schools near you! How Does a School Earn Accreditation of the Sonography Program? Is a Career as an Ultrasound Technician Right for You? What Do Ultrasound Technologists Do During a Typical Workday? When students choose accredited ultrasound technician schools, they are ensuring they will receive the best training that can equip them for a lifetime of success as a Diagnostic Medical Sonographer. Students should only attend sonography training programs that are accredited by the Commission on Accreditation of Allied Health Education Programs (CAAHEP). CAAHEP accredited on-campus and online or distance education programs are available. All CAAHEP accredited ultrasound technology programs – on-campus and online – require a large block of practical clinical experience which is a major consideration for student planning. Please note that schools and programs are accredited by various agencies and commissions. School or institutional accreditation and program accreditation are not the same thing. For example, a school might be accredited by the regional Council for Higher Education, whereas the Diagnostic Medical Sonography program is accredited by the CAAHEP. It is important to verify CAAHEP accreditation of the ultrasound technology program, and using our list of schools with CAAHEP accredited ultrasound technician programs will get you started on the right path. Each accredited program has a curriculum that follows standards set by the American Registry of Diagnostic Medical Sonographers (ARDMS). The curriculum consists of classroom instruction, lab work and clinical. The main difference between accredited and non-accredited programs is that students completing non-accredited programs may or may not have met the ARDMS standards and are likely to need an additional year of clinical training in order to sit for the ARDMS credentialing exams. Until specific course and clinical training requirements are met, the ARDMS will not allow students to sit for exams. Accreditation is a process for assessing the quality of an educational program. For Diagnostic Medical Sonography, the nationally recognized accrediting agency is the Commission on Accreditation of Allied Health Education Programs (CAAHEP). When an ultrasound program is accredited by the CAAHEP, it means the program has met the requirements as described in the Standards. The requirements include written program goals, minimum and appropriate staffing, quality clinical resources, qualified faculty and advisors, and effective student evaluation and assessment procedures. Most of the standards carefully address the curriculum requirements and are designed to ensure students gain the knowledge and understanding needed to deliver the highest quality of patient care while performing ultrasound examinations once employed. Programs that meet the CAAHEP standards fully prepare students to take the ARDMS exams upon graduation without the need for additional coursework or clinical training. It is one of the important benefits of selecting a CAAHEP accredited sonography program. The CAAHEP has accredited over 2,100 education programs in a total of 28 different health science professions, including medical assisting, advanced cardiovascular sonography, surgical technology, and Diagnostic Medical Sonography. The Commission is recognized by the Council for Higher Education Programs. However, not all states have CAAHEP-accredited programs. Students can attend non-CAAHEP accredited sonography programs, but they will probably have to spend an additional year after graduation getting the minimum clinical training required to sit for the ARDMS exams. In addition, employers recognize CAAHEP accreditation as proof the job applicant graduated from a high quality program. If a CAAHEP accredited program is not available in the preferred state, consider schools in surrounding states or an online program. If that is also not possible, attend a school that has institutional accreditation by one of the government agencies as a minimum, recognizing it will be necessary to gain an additional year of clinical training in order to sit for the ARDMS exams. Find top ultrasound technician schools near you! The CAAHEP has 23 Committees on Accreditation, and one or more of them is responsible for conducting the accreditation process. The process begins when a school submits an application called a Request for Accreditation Services Form. The form is submitted to the appropriate Committee on Accreditation, which in this case is the Joint Review Committee on Education in Diagnostic Medical Sonography (JRC-DMS). The Committee is composed of people with a high knowledge of and experience in Diagnostic Medical Sonography, making them uniquely qualified to assess programs. Once the self-study has been reviewed and accepted by the JRC-DMS, a program site visit is scheduled. The site visit also has a set of requirements. For example, there are certain materials that must be available to the Committee members when they arrive at the site. They include documents like equipment and supply inventories, staff position descriptions, exams and clinical evaluation forms, the Student Handbook, student records, clinical experience records and much more. Sonography program staff put a lot of effort into ensuring everything is easily available to the site team. A typical site visit to an ultrasound technology program will take two days. During that time, the site visit team will meet with program officials, including the chief administrative officer, program director and clinical coordinator. The team also meets with students currently in the program. After meeting staff and students, the site team will visit clinical sites and begin reviewing the many documents the program staff assembled. Review of the documents takes place over both days of the site visit. The site team will tour the program classrooms, laboratories and library to verify the facilities are up to par. Team members will also meet with the faculty and hold exit interviews with program officials. A site visit may encompass a review of multiple concentrations if the program offers such. What the site team finds during the visit must agree with the narrative and technical information in the self-study. If the school does not agree with the final recommendation, there is an appeals process that can be initiated. The CAAHEP wants to help programs get accredited because it means more students have an opportunity to attend an accredited program in their area. However, it will not compromise on its Standards. To maintain accreditation once an accredited school, the program has to meet certain responsibilities. For example, any changes in required program personnel or the senior school positions, like dean of health professions, must be reported to the JRC-DMS and CAAHEP. The JRC-DMS may decide to schedule new comprehensive reviews to make sure the program still meets the Standards after the changes in program staff, facilities or curriculum. The accreditation process requires a major commitment on the part of the educational facility in the way of all types of resources – human, equipment and financial. The school pays significant fees and expenses to initiate and complete the accreditation process. It is a long process in which the program makes sure it meets each requirement of the Standards to obtain initial accreditation and then commits to maintaining the Standards over the long-term. 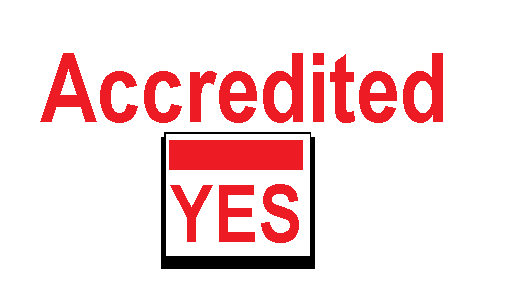 Accreditation is a sign of quality in faculty, curriculum and student support services. It is one reason why schools prominently display their accreditation status on websites and in marketing materials. Students who complete a CAAHEP accredited program can schedule ARDMS exams after graduation knowing they have been well-prepared for success. Distance learning programs are offered by two institutions offering distance learning programs, which allow students to complete online coursework leading to a certificate or degree in medical diagnostic sonography. Clinical internships must be completed at an approved health care facility. Both schools will help distance learners find approved clinical placements in areas convenient to the students when additional clinical training is required. Sonographers can earn a diploma, certificate, associate degree, baccalaureate or master’s degree. Most students earn at least an associate degree or a postsecondary certificate and then take the ARDMS exams to get credentialed. All students must take the ARDMS Sonography Principles & Instrumentation Examination, but can specialize by earning credentials in a particular ARDMS area like cardiac, vascular or muscuskeletal and by taking certain specialty exams. To improve competitiveness for admission into the desired sonography program, high school students should take human anatomy, physiology, biology, chemistry and mathematics courses. Students pursuing a sonography education will need to decide the type of certificate or degree desired which is influenced by career goals. Sonography certificate programs provide sonography training to anyone who has already earned a science degree or is a graduate of an accredited allied health program, such as nursing, and wants to add sonography as a specialty. In some cases, certain work experience can be applied towards clinical training requirements. Specific prerequisites for admission into the program vary from program to program. In most cases a sonography certificate can be earned in as little as one year. An associate degree in sonography is sufficient for entry-level sonography positions. The program requires classroom and clinical training. Associate degrees can be earned in two years. It is a standalone degree but credits can be applied in the future towards requirements for a bachelor’s degree in sonography should the student choose to pursue a four-year degree for career advancement purposes. A bachelor’s degree in sonography enables a sonographer to qualify for a variety of sonography positions, including as a consultant or department head. Students with a bachelor’s degree can also apply to a medical school. Students who have already earned a two-year associates degree can earn a bachelor’s degree with an additional two years of education. Without an associate degree, students usually complete a bachelor’s degree program in four years. A graduate degree in ultrasound technology is appropriate for students that want to teach at the university level or work in private industry. The advanced degree also equips students to perform specialized research and to publish their findings in medical journals. Currently, the master’s degree is the highest degree in sonography that can be earned from a CAAHEP accredited program. Most master’s degree programs take at least two years to complete. Sometimes, nurses or radiologists gain on-the-job sonography training. Some sonography programs will give the student didactic or clinical training credit for experiential knowledge. The student can complete any additional sonography program requirements and earn a certificate or degree in sonography that qualifies him or her to sit for ARDMS exams. There is also a growing interest in physician registration in ultrasound sonography so the ARDMS now offers credentials in vascular interpretation and musculoskeletal sonography for physicians. Physicians can also decide to add general sonography to their credentials by attending a sonography program. After completing an accredited sonography technician program and passing an exam, students earn ultrasound certification and/or licensure in their states. Check in which states sonographers are required to get license. The ARDMS and the states licensing sonographers require sonographers to earn continuing medical education (CME) credits throughout their careers in order to maintain their ultrasound technician certification or license. Currently, certified sonographers must earn a minimum of 30 ARDMS approved CMEs within a 3-year period after initial certification. A re-certification assessment is required every 10 years. However, sonographers are encouraged to regularly complete CMEs throughout their career in order to stay current in knowledge and skills. Check where to get free and Paid Ultrasound CME. If you are looking for sonography programs in Canada, visit accredited Diagnostic Medical Sonography programs in Canada. School programs are accredited by the Canadian Medical Association and credentialing exams are administered by Sonography Canada. How to Become an Ultrasound Specialist? There are more than 200 accredited programs in the United States in diagnostic medical sonography or one of its sub-disciplines of vascular, cardiac or pediatric cardiac sonography. To be admitted into a sonography technician program, students must meet stringent program application requirements. In every case, students must have a high school diploma and have completed certain classes in biology, physics, chemistry and algebra. If the appropriate classes were not completed in high school, the student will be required to take college level courses in these subjects in order to complete application for admittance into the sonography program. In addition, students are required to complete college prerequisite coursework in subjects like communication, medical terminology, human anatomy, physiology and physics. The sonography program consists of classroom work and labs, and clinical training in a healthcare setting under the supervision of a registered sonographer. General sonography includes the examination of tissues, organs and structures of the abdomen, chest, lungs, reproductive system and cardiovascular system. The program length varies between one to four years depending on the certificate or degree plan and the level of experience and academic background of the student. Cardiac sonography examines the heart’s chambers, valves, walls, veins and surrounding muscles. Studies in cardiac sonography include principles of general sonography with an emphasis on human cardiovascular structures. Approximately 70 programs accredited by the CAAHEP offer this specialization. Program duration is 12 to 18 months depending on the program selected. Vascular sonography specializes in the vascular system, including veins, the heart and lymphatic system. More than 60 accredited programs are available nationwide. 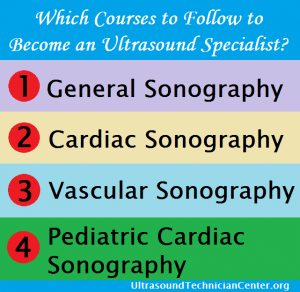 Some accredited ultrasound technician schools combine vascular sonography with general sonography while others offer separate programs. Program length ranges from 12 to 27 months depending on the degree plan. Pediatric cardiac sonography is concerned with children’s cardiac structures and abnormalities. Two educational institutions, Alvin Community College in Texas and the University of Wisconsin in Milwaukee, offer a specialty in pediatric cardiac sonography. Many programs nationwide include the pediatric sonography sub-discipline as part of cardiac sonography. Ultrasound technology is an expanding career field offering exciting opportunities in the healthcare field. Sonographers utilize a variety of skills that include delivering ultrasound exams, communicating with patients and their family members, managing sophisticated equipment and completing medical records. There are many reasons people decide this is the right career choice. Ultrasound is a non-invasive and cost-effective way to diagnose diseases, detect birth defects and enhance surgical procedures. It does not involve using radiation. Unlike the radiology technician, neither the patient nor the ultrasound technician is exposed to potential complications that can arise from repeated use of radiation. Becoming a Diagnostic Medical Sonographer gives students the chance to harness cutting edge medical technology that enables a patient to receive lifesaving treatments. Technology is also expanding career options as ultrasound equipment is made more portable, enabling sonographers to deliver patient care in the home and in other locations outside health care facilities. Ultrasound technicians improve patient lives and make a significant contribution to the delivery of quality healthcare services. Ultrasound technicians work with a variety of medical personnel that include physicians, nurses, health care aides and other sonographers and technicians. General sonographers can always pursue additional specializations like vascular technology, cardiac technology, or musculoskeletal sonography at any time. Though there is no longer a pediatric sonography credential, ultrasound technologists can take the specialty exam in pediatric sonography or pediatric echocardiography and specialize through their career path. Sonographers are very likely find employment in the preferred state or city where there are medical or healthcare facilities. For the period 2014-2024, the U.S. Bureau of Labor Statistics (BLS) projects that sonography jobs will grow by an average of 26.4 percent, which is much faster than growth in other professions, including other related healthcare occupations. Also per the BLS, the 2017 sonographer median salary was $71,410 annually or $34.33 per hour. You can compare a career in sonography to other related healthcare occupations like x-ray technician, registered nurse or medical assistant. You may want to compare sonographers with related healthcare occupations. Different structures and different types of body tissues reflect sound waves in distinctive ways. A sonographer uses sound waves generated by an ultrasound machine to examine the inner workings of a patient’s body. Duties include taking a patient’s medical history, operating diagnostic imaging equipment, reviewing images to ascertain their accuracy, analyzing diagnostic information for submission to physicians, and maintaining patient medical records. Ultrasound in pregnancy is one of the most well-known uses of ultrasound. The ultrasound equipment works by sending high-frequency sound waves into the body through a handheld transducer to get an image of the fetus. As the sonographer passes the transducer over a body part, the computer transforms the reflected sound waves into images. However, obstetrics is just one field of practice for sonographers. Others include gynecology, breast, abdomen, musculoskeletal, cardiac, cardiovascular and pediatric sonography. While ultrasound is noninvasive, sonographers that specialize in cardiac or vascular sonography may assist physicians in an operating room when performing procedures like placement of stents or pacemakers. Duties of sonographers depend on his or her work environment, but most sonographers spend large portions of the workday on their feet. Many sonographers work in hospitals, but some work in an imaging clinic, diagnostic laboratory or with a physician in private practice. There are also sonographers who deliver mobile ultrasound exams in mobile medical units to people who have no access to medical facilities. Another option is to work for a medical staffing agency as a traveling Diagnostic Medical Sonographer, delivering services as needed in a variety of environments. The job does have physical requirements. Sonographers must be strong enough to lift patients on and off of an examining table. They also need full use of their shoulders, wrists and hands. Additionally, they need good visual acuity and the ability to distinguish subtle differences between shading on images sounds. Watch videos about sonographer education and careers. Sonographers assist a wide range of patients, ranging from the healthy to the critically ill. Depending on the facility procedures, the sonographer must manage the scheduling of patients or work with the ultrasound department scheduler to ensure smooth patient care. Sonographers greet patients, take medical histories and position patients on the exam tables. All sonographers deliver both oral and written summaries of their findings, alerting doctors to potential irregularities as they evaluate and review ultrasound images. They must also record an accurate medical history for each patient and provide top-notch patient care. By using their skills to evaluate diagnostic studies, sonographers determine whether patients need additional tests. Many sonographers also catalog patient images in a picture archiving and communication system, or PACS. Sonographers must be willing to learn new ultrasound technologies which include mobile wireless transducers and advances in 3D and 4D imaging. Some machines can merge ultrasound images with magnetic resonance imaging (MRI) and computed tomography (CT) scans to diagnose hard-to-find tumors or lesions. Ultrasound technicians also have departmental duties. For example, they may need to ensure appropriate supplies are stocked or might assist other medical personnel as needed. Successful sonographers enjoy working with people, embrace new technology and make a difference in people’s lives. As researchers find more applications for ultrasound, sonographers can expect a lifetime of learning and professional growth.